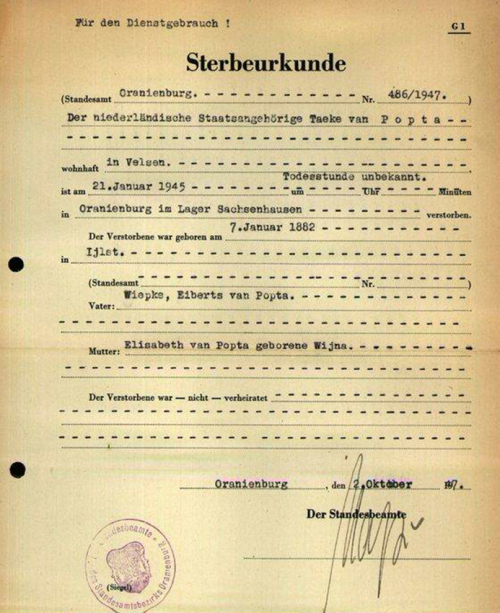 My spine is tingling: someone emailed me a copy of the death certificate prepared by some German official after my Grandfather Van Popta died of dysentery in a WWII concentration camp near Berlin. What I find stunning is how meticulous the Nazis were in their record-keeping. On the one hand they savagely imprisoned all sorts of people like my grandfather for their "political crimes" who, when they died, went up the chimneys; on the other hand they issued death certificates that included date and place of birth of the deceased, the names of the deceased's parents, and such "normal stuff." Chilling to see this disconnect.